Moore subsequently had the Maserati’s prepared and readied for the 1941 race as the 'Elgin Piston Pin Special’s” made up half of his unprecedented four car armada. Moore’s three primary entries featured lead driver Mauri Rose; qualifying the No. 3 Maserati on pole, with teammate Dennis “Duke” Nalan starting the No. 17 Maserati on the outside of Row 10, in “P30.” While the unheralded Floyd Davis would roll off 17th aboard the trusty No. 16 Noc-Out Hose Clamp Special Wetteroth/Offy race car, while Moore also had an interest in a fourth race car, as Cliff Bergere was contesting the race aboard the No. 34 Noc-Out Hose Clamp Special, the ex-Moore/Floyd Roberts Wetteroth/Offy chassis. Meanwhile, Joe Lencki once again entered his two car stable of six cylinder designed Lencki’s with Emil Andres at the controls of the No. 19 Kennedy Tank racecar (Lencki 4V) qualifying 15th, while George “Joie” Chitwood was aboard the No. 25 Blue Crown SpL. (Lencki 2V) Also referred to as the “Little Six,” Starting from 27th. (Lencki now claimed his 4V engine was of 265cid displacement). Andres would retire on lap 4 after being involved in an accident, while Chitwood solidered home to a 14th place finish, 33 laps behind. 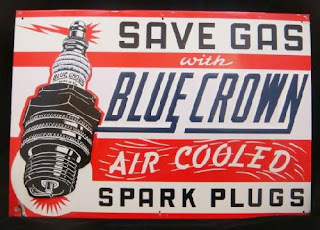 The Blue Crown Spark Plug Company was making its foray into the Indy 500, by sponsoring one of Joe Lencki’s racecar’s this May, with the aforementioned Chitwood as the pilot. 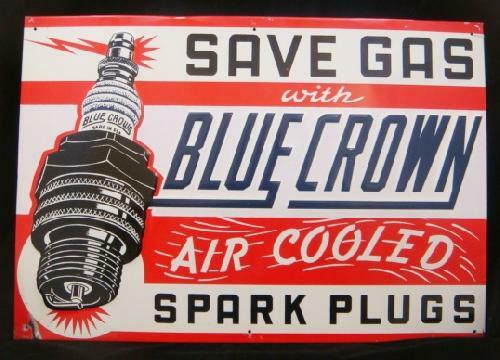 Blue Crown Spark Plug was a product of the Motor Master Products Company in the 1930’s and at the height of business, Motor Master Products was selling a range of 90+ spark plugs. 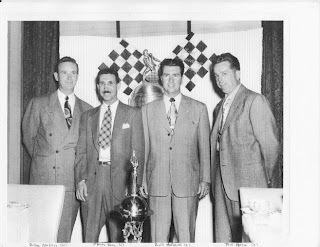 This was during the era of when Chrysler owned the Autolite spark plug concern and General Motors owned AC spark plugs with Champion also doing business. And for this 29th running of the Memorial Day classic, the front row’s three starter’s are the same in two consecutive Indy’s For the very first time, along with being the top three finishers from the previous year. As Rose started from the Pole, with Rex Mays and Wilbur Shaw alongside respectively; having led the race for six laps, Rose retired with engine trouble on lap 60. 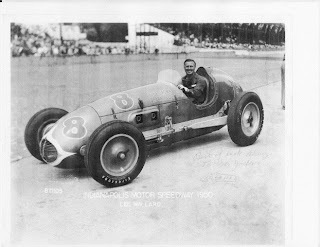 However, he finally won driving the Floyd Davis car; from the same stable of Lou Moore’s, while “Duke” Nalon finished in fifteenth place, twenty seven laps behind the winner. Speculation suggests that team owner Lou Moore and driver Floyd Davis were both of strong bull-headed opinion; supposedly with Moore fast growing displeased with Davis’s race performance, who was at the time running in 11th place. Bergere, racing on Moore’s savvy strategy, was trying to complete the race without making any pit stops and eventually would be forced to slow down in order to finish the race. Thus smelling blood, Mauri swept by on lap 162 as the two combatants’s sped down the front straightaway in lockstep, before Bergere would fade to 5th place. Upon his triumph, Rose tried doing everything in his power to share the victory laurels with Davis, even having come to a crawl on the pit lane whilst trying to hand over the winning race car to Davis to drive into victory lane... Yet, a dejected Davis was nowhere to be found and a widening rift between him and Moore would lead to their eventual falling out, as Davis was not to be featured in the winner’s photographs the following day. On an interesting side note, starting the race from 10th and finishing fourth was the little known No. 54 Bud Winfield prepared Bowes Seal Fast Special, with Ralph Hepburn behind the wheel of what was the forbearer to one of Indy’s most popular post war race cars, affectionately known as the Novi. 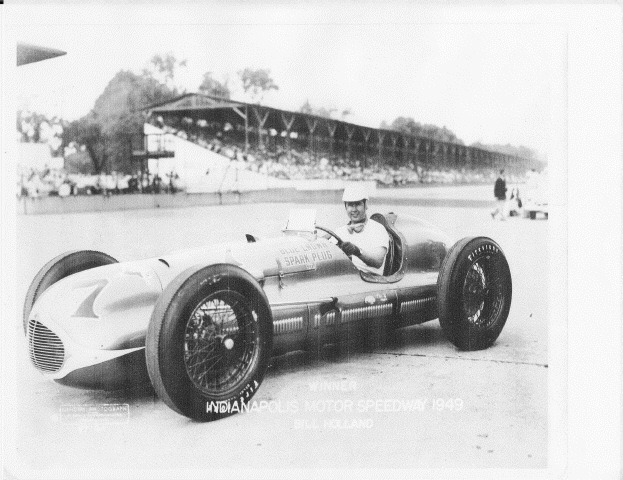 This particular race car was actually one of the previous ten front engine 1935 Miller Ford’s, with it’s alluring body panels having been hammered by Emil Deidt, as Henry Ford had sold off the cars piecemeal to private collectors after the fiasco of the ’35 Indy 500, in which all of his race cars failed to finish. And like the majority of top line racing Lumps of the period, once again the Novi engine’s designer was the renowned Leo Goossen, while Bud Winfield was responsible for developing the supercharged V-8, after Team Boss Lew Welch told him to go ahead and build it!